Moonbow started eating less and not enjoying his kibble as much recently. He also ate some grass and threw up a few times so I thought He may have an upset stomach. He's on no grain Orijen kibble but the main ingredient was chicken. So I decided to try another blend. I tried the fish blend and the beef blend, he loved both. Ate it right up. So I bought a bag of it. Then, this morning I went to feed him the fish blend. He didn't want it. I tried mixing in some chicken, still didn't like it. I waited until 12 noon and tried to give him a bowl again. Still didn't like it. I was concerned of him not eating so I put a little peanut butter in there, then he ate it. lol But I am concerned. I need him to eat more than this, I can tell he is hungry because he'll take treats, bones, peanut butter or cheese. He's having problems with the kibble. Any ideas?? 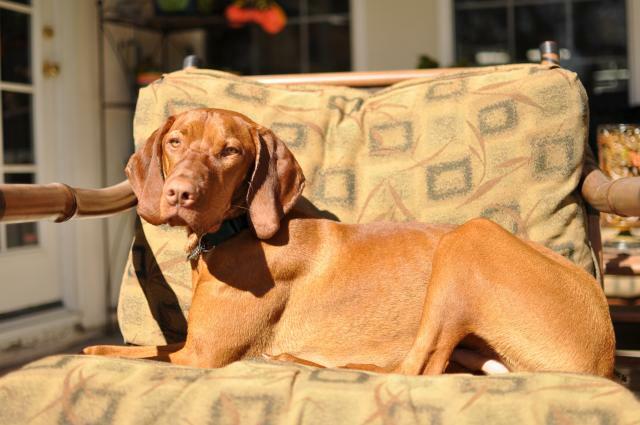 By the way Moonbow is 15 weeks old male Vizsla. Otto went through a similar situation with his kibble. We had him on Blue Buffalo at first, but he started losing interest and hardly even finished a bowl and sometimes barely ate half. He wasn't putting on too much weight at that point either. We started him on Taste of the Wild and he LOVES it. We've been using it as treats for about two months now because he is so crazy for it. He looks much more healthy, IMO. In a recent thread, some other members mentioned that they feed their pups the same brand-- "Puppy with soft stools" is the thread. I remember my puppy being a picky eater too, and we also had a week or two where she vomited randomly a couple times (nothing we could find a pattern to, as it wasn't after she had just eaten or exercised or anything in particular that we could figure out as a trigger). She was eating Iam's Smart Puppy kibble, which the breeder had started them on. The vet wasn't too concerned (in our case) because she was growing well, energetic (! ), pooping well, and her stool tests were normal. What worked for us in terms of her picky eating, was to pour a small amount of warm water on top of the kibble. I think it made it a bit squishier and smellier, both of which she seemed to like. We just gradually put less and less warm water on it each day and she continued to eat up. He might have also reached the stage where he hates his bowl. Try putting some of the kibble on the floor, in an upside down frisbee, or in your hand. I finally figured out that Savannah hated having her whiskers touch the side of the bowl. Sadie went through the same thing as a young pup - I think most Vizsla pups just don't truly enjoy eating much of the time (I wish I could be struck down with that "problem" - ha-ha!). She's doing better now (10 mos old). She gets a small meal in the morning that she reluctantly eats - spilling food everywhere while she looks around at our dachshund who is standing near her to pounce on her food if she doesn't eat. At about 5-6pm she is a voracious eater. Not a kernel hits the floor much to our dachshunds regret. That's her big meal of the day. I wouldn't worry about it too much unless the pup becomes feverish or listless indicating illness. He will eat eventually. Lots of post on here about this. We feed her Taste of the Wild, which comes in 4 varieties. When I notice her having a hard time eating, I just switch up the kind I am feeding her to another variety. It's generally enough to keep her interested. When I am really hard up, I put on a scoop of pumpkin and that generally helps too! I think it is adaptive and it's good they don't eat in the morning. Running with a full stomach is counterproductive, a waste of energy. We exercise in the morning and afternoon and Sam doesn't eat much during the day anymore. That doesn't mean I cannot make him eat. He will eat raw chicken wings like candy, or those food rolls in the freezer at Petsmart. If I choose to treat him with food he really likes to eat, he tends to sleep more during the day. Not necessarily a good thing. We look at the ribs when he turns, ribs should be visible only when he turns. Also he must have a well defined waist. Our V is completely OPPOSITE! He will eat anything and everything, all the time if he could. He just turned 1 - he is happy, healthy, very active and high energy. We are running him 3-4 times a week a few miles, he gets a walk every day and off leash running up and down our horse trail. We feed him two cups in the morning and two at night, just switched to Taste of the Wild, which is helping with some weight gain, but he is ALWAYS hungry it seems. Any guidance out there?? This will sound horrible but don't feed him anything else till he eats what is in his bowl otherwise your creating the problem.